Thu Pham prepares Vietnamese coffee at Ca phe Roasters, her small-batch Asian coffee roastery at MaKen Studios North in Harrowgate. From the windows of her coffee roastery, Thu Pham sees SEPTA trains roll through the Harrowgate section of Kensington on the Market-Frankford line. 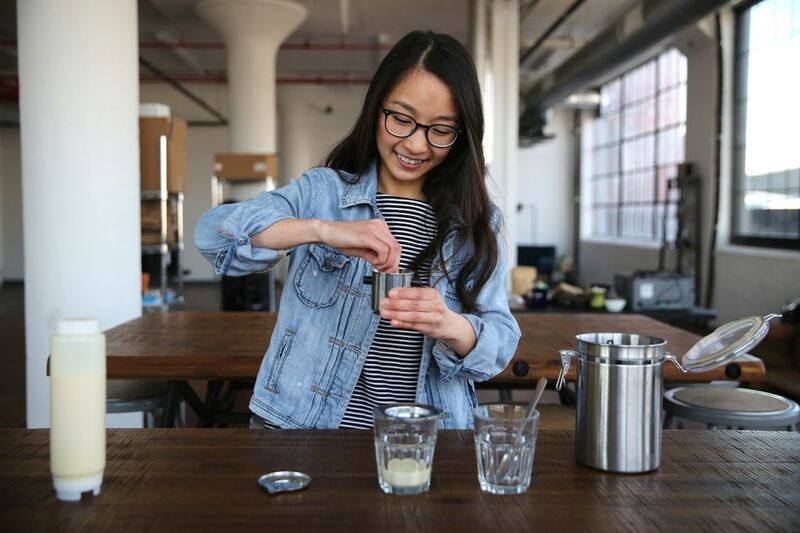 Pham, who roasts single-origin Vietnamese coffee in a converted warehouse amid neighbors who make ice sicles, ice cream, kombucha, and crafts like ceramics and shoes, believes it won’t be long before those trains start bringing people to her door. Pham’s plans for her company, Cà phê Roasters, include someday opening a cafe on nearby Kensington Avenue. A daughter of immigrants, Pham grew up in Olney watching her older sister crack ice with her hands, pour condensed milk into a glass, and stir it with a long spoon, always giving Pham a taste. Thu Pham pours Vietnamese coffee beans into her roaster at Ca phe Roasters at MaKen Studios North in Harrowgate. Cà phê, housed in the MaKen Studios North Building at 3525 I St., is one of a growing number of food-focused businesses taking root in and around the city’s Harrowgate section, an impoverished enclave northeast of Kensington that borders Port Richmond. Much of that growth has been encouraged by Shift Capital founder Brian Murray, whose social-impact-focused development firm has bought about 1.5 million square feet of property in the area, including the two cavernous MaKen buildings and storefronts along Kensington Avenue. Murray envisions a future in which the avenue is transformed into the city’s next thriving commercial corridor, with bakeries, restaurants, and microbreweries. But he said he was equally focused on revitalizing the community in a way he described as “anti-Amazon,” with independent shops that serve neighborhood residents and visitors, and businesses owned by women and people of color. In Harrowgate, a post-industrial neighborhood sandwiched between Port Richmond and Kensington, business is booming again. Before Shift bought them in 2014, the MaKen buildings (short for “Made in Kensington”) were used as a textile mill and to store fabric. A stone’s throw from the epicenter of the opioid crisis that has ravaged parts of Kensington, the renovated studios total about 250,000 square feet and now house artists and manufacturers, such as woodworkers and clothing businesses. Larger tenants include Little Baby’s Ice Cream and Snap Kitchen, which in 2016 built a kitchen in MaKen South to prepare food for the company’s retail locations and hired local residents to work there. In fall 2017, Shift Capital launched the Kensington Avenue Storefront Challenge, soliciting small-business proposals and awarding nine projects, including Pham’s, with a year of free rent, advice, and money for renovations. In the coming months, those businesses will start to emerge. Pound Cake Heaven, a bakery that operated in Yeadon and from a truck, is set to open at 3415 Kensington Ave. on April 26. Naturally Sweet Desserts, a vegan bakery offering late-night deliveries, also plans to open this year, as does a Philly Pretzel Factory franchise. Nearby business owners say the neighborhood already is shifting. At the Loom Building, a former carpet mill at 3245 Amber St. less than a mile from the MaKen buildings, tenants include many artists, Passero’s coffee, and Sacred Vice Brewing, a one-room brewery with a tasting room that is open on weekends. Justin Steinberg, co-owner of Sacred Vice Brewing in Harrowgate, works early one Saturday morning. Founders Justin Steinberg and Matthew Brodsky brew small-batch beer and sell to a handful of bars. After opening the tasting room in November, the metal sign they put out front was stolen twice. They noticed that Uber drivers either waited to make sure people got inside safely or stopped at the end of the block and refused to go farther. “Once someone comes, they don’t have a problem coming back,” Steinerg said. “There’s a treasure hunt aspect to it, and there’s certainly something appealing about that to some people." Sacred Vice Brewing in Harrowgate. The three founders of Fishtown Ferments, a company that sells jars of naturally pickled vegetables in local stores, this year hosted two pop-up dinners in its headquarters, a warehouse with a kitchen off Aramingo Avenue on the outskirts of Harrowgate. Each dinner was attended by 30 people, who sat at folding tables to enjoy dishes made with fermented vegetables like kimchi and sauerkraut. Pham was familiar with the Harrowgate section when she moved into the MaKen building in December. After graduating from Drexel University, she got involved with 12+, a nonprofit that helps students pursue postsecondary education, and worked at the nearby Kensington Health Sciences Academy. She launched Cà phê with two business partners, including 12+ founder Raymond John, after hearing of the storefront challenge. She learned roasting techniques by immersing herself in research, and last year started roasting Robusta beans, lesser-known beans grown in Vietnam. Thu Pham at Ca phe Roasters, her small-batch Asian coffee roastery at MaKen Studios North in Harrowgate. She sold her first cup of coffee at last summer’s “A Dream Deferred” exhibit at the Northern Savings Fund building on Spring Garden Street, then at other pop-ups around the city. She makes four blends, including one from Thailand, and plans to source beans from China, Korea, and Indonesia in the future. After launching her online retail business, Pham will focus on opening her coffee shop, which she said will serve espressos, lattes, and other drinks. She plans to donate a portion of profits to 12+, and hopes to one day bring some of those students into her business. “I’m hoping to create opportunities for them,” said Pham, who worked in a restaurant as a teenager and college student. “I want them to learn similar things to what I learned, because I see now how much these skills have helped me as an adult. Being here in this community is a big part of that to me."